Here's a second look at the Mane penalty appeal - lucky to avoid a booking? 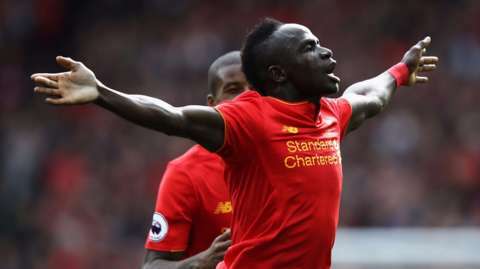 Was Sadio Mane lucky to avoid a yellow card for diving inside the area within the first few minutes of the game this evening? On first viewing it looked like our new signing might have had a great shout for a penalty, but on closer inspection, it’s quite apparent that Sadio sticks his leg in-between Allan Nyom’s legs, looking for the foul. The linesman was quite clearly flagging of the far side, presumably trying to alert the ref to the possible simulation, but the man in charge opted to ignore it. Sadio clearly didn’t spend too long dwelling on it, he fired us ahead on the 20-minute mark after some wonderful build-up play involving Can, Coutinho, and Firmino. Let us know what you think about the “foul” in the comments below.